Bread two days in a row. What’s going on? Actually, there were several days between these two breads. This one was made yesterday. It was in response to something I saw in one of the weekly grocery fliers that got my hackles up. One of the local groceries were advertising a particular bread for the Easter weekend. It is/was one of my favourites: Ancient Grains. The “is/was” is on purpose. It IS one of my favourite tasting breads, but that brand WAS the one I used to buy. It is now waaaay too expensive. Approximately $4.50 per loaf for commercial bread is ridiculous. Ridiculous I say! I know, it’s food, but it’s also “food.” We all can make something similar – and probably with less chemicals. They even give clues to how to make it right on the bag (Thanks Health Canada). Their ingredient list is long. I shortened mine to four Ancient Grains. Even they’re not very exotic. We can get them readily at either health food or bulk food stores. They’re good to throw into many baked goods. Here’s a little info on my four friends. Some “grains” have been used as food sources for millennia without any genetic alteration. 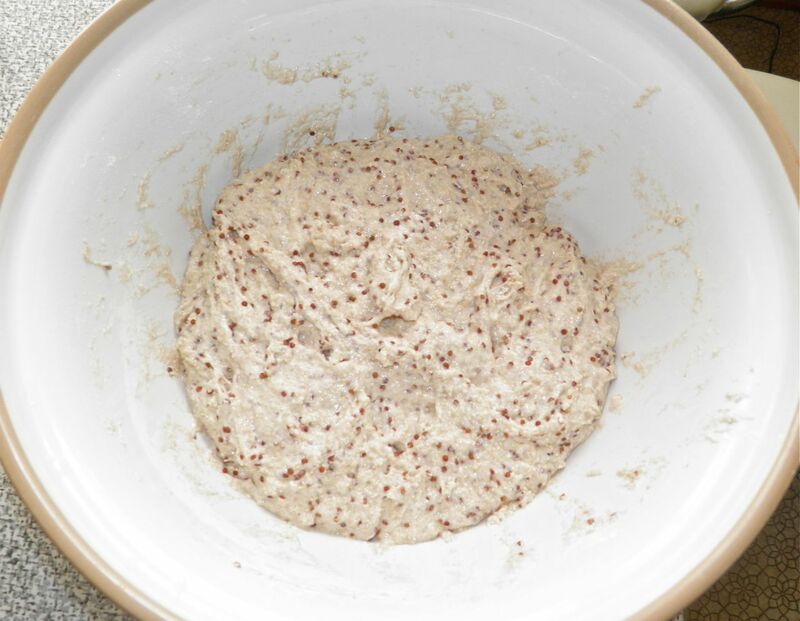 They include spelt, kamut, teff, quinoa and amaranth. The first three are true grains from grasses. The last two are seeds. I didn’t use teff, although it was available. Spelt and kamut are not gluten-free but some people with gluten sensitivity can eat them in limited quantities. Even more so after first rise. Spelt traces its heritage back before many wheat species. It has a nut-like flavour and a much wider nutrition profile than many of its in-bred wheat cousins. Kamut is closely related to durum wheat, although it is considered nutritionally superior. It was probably first grown as a food in Ancient Egypt. Quinoa is used like a grain although it is a seed. It is a pseudo-cereal from the family Chenopodium. Quinoa is also related to beets, spinach and tumbleweeds. Amaranth was used in middle and southern ancient America. Some species are used today in North America as an ornamental garden flower. An example is Love Lies Bleeding. It is a pseudo-grain. It is high in protein and is a source of some essential amino acids. So those were my ancient grains. 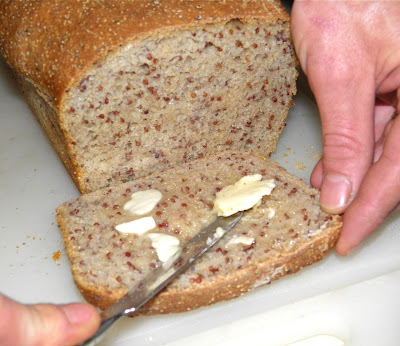 The quinoa and amaranth are more for nutrition and crunchy goodness rather than bread structure. Which leads me to my next ingredient. scraper. It will start to obey. My main ingredient was unbleached white flour. Whenever using unfamiliar grains it is wise to use enough regular flour to ensure your bread will rise as you hope. Some ancient grains don’t have the same gluten structure. So if you’re used to making regular wheat bread it night be best to add a little ancient grain at a time until you get the hang of the new ingredients. This dough is very, very wet. For those who don’t like kneading you’re in luck. You can’t. It morse closely resembles jello than bread dough. The final shaping is done with a dough scraper, and then it’s flopped (and I mean that) into a loaf pan to rest before baking. This dough takes 8 hours for first rise, 1 hour for second and then 30-40 minutes to bake. So it’s easy to make either when you get up (and finish when you get home from work) or mix it up before you go to bed and then finish before you go out the door. This isn’t a substitute for the brand that I was imitating, but that was on purpose. I intentionally didn’t use all the grains in the commercial brand. 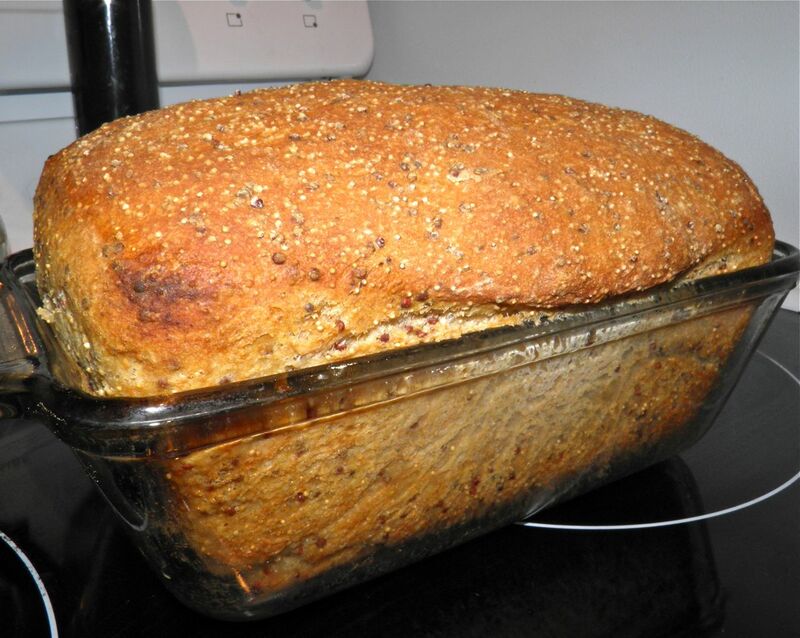 But if you’re looking for a health boost in loaf shape you should try this recipe. Its nutty tast is hard tyo not fall in love with! I had made another bread, Kéfir and Ancient Grains, in 2011 using a pre-mised flour of 12 grains. If you’re interested, the link is here. Tah-dah! A nice looking – and tasting – loaf. Combine all ingredients in a large bowl. Mix together and then beat with a spoon for about two minutes. Cover the bowl with plastic wrap and a towel. I find using a plastic grocery bag (just stick the whole bowl in and tie it) works wonderfully. 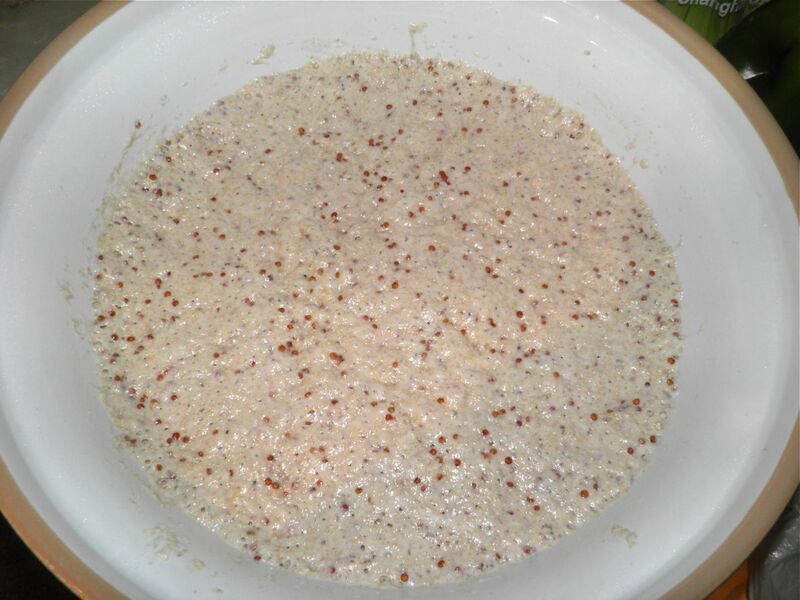 Let the dough rise for 8 hours. Go to work, or go out and enjoy your day – or go to bed and tackle the next step in the morning. Pour the risen dough out onto a floured board. 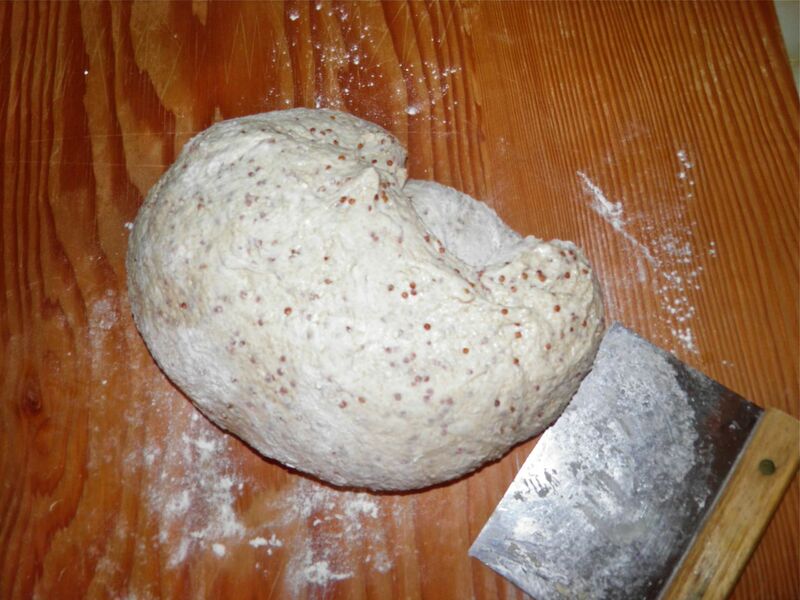 Using a dough scraper, fold it over itself about 12 times with a scraper. Do left, right, top and bottom. The dough will slowly respond to your attentions and begin to stay in a shape. Grease a 5” x 9” loaf pan with butter. Lift the loaf and place it in the pan. Pat the to down so the dough goes into the corners. Let rest for one hour. Heat the oven to 450°F with a pan of water on the bottom rack. Bake the loaf for 10 minutes, then remove the water and bake for between 20-30 more minutes. The top will be dark brown and will sound hollow when tapped with your fingers.